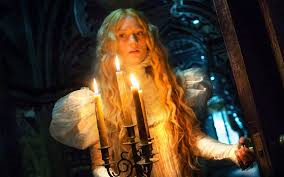 Crimson Peak strikes me as a beautiful rarity because it deals so heavily in the business of books. It’s a ghost tome with elements of a Gothic love story that could have easily been written in the late 1800s. With its references to murder, forbidden love and secrecy, it could have easily been a Brontë story. 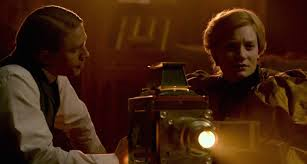 However, what sets it apart for me is that fact that two of our lead characters, Edith (Mia Wasikowska) and Alan (Charlie Hunnam), separately represent two different types of literary genres that manage to blend together to form a third: the combination of Gothic, semi-autobiographical ghost story with the scientific whodunnit to synthesize the coexistence of the fantastical with the real world. Gotta love a Gothic ghost story. The character Edith represents many different facets of the Gothic genre, effectively making her a type of book unto herself. Edith, as a female writer, receives a condescending comparison to Jane Austen at one point from Mrs. McMichael, who is clearly using the reference to cut down both Edith’s profession and the socially acceptable notions of femininity (i.e., marketability for marriage) of the time period. Edith responds by stating that she feels a more apt aspiration is to be like Mary Shelley: “She died a widow.” In this sentence, Edith does more than just fight back against an uppity rival: she manages to draw multiple comparisons to Mary Shelley that echo throughout the film, including foreshadowing the death of Thomas. Mary Shelley’s birth resulted in the death of her mother, the noted feminist Mary Wollstonecraft, whereas Edith’s mother was taken by cholera. Both girls had to navigate life in the face of supportive fathers who ultimately disapproved of their suitors: for Shelley, it was the rejection of Percy Shelley by her father William Godwin (who wasn’t too hot on the idea of his daughter being in an open relationship with a man that was already married); for Edith, her father rejected the marry-and-murder cycle of the Sharpes. Both women then left the comforts of their home to travel to less-than-ideal conditions – while Edith was taken to the crumbling and chilly Allerdale Hall, Mary found herself carted around Europe by Percy to evade her angry father. Both atmospheres resulted in physical distress for the women. As Edith is poisoned and begins coughing up blood, Mary found herself unable to sustain a healthy pregnancy and/or successful birth/infancy. These similarities work to make Edith a type of thinly-veiled autobiographical recounting of Mary Shelley’s experiences, which ultimately served as the basis for Frankenstein. Edith is the survivor that escapes a sad childhood and moves on to do battle against the sorrowful ghosts of the past, while managing to provide redemption of the imperfect man that loves her. In essence, Edith becomes literature by serving as the reflection of a troubled fellow writer – her story becomes the classic Gothic ghost story with a love subplot that her editor suggested she write. Have to admit, this is quite literary. Alan, on the other hand, is more of a medical mystery novel – a type of Robin Cook book crossed with shades of Arthur Conan Doyle. It’s no accident that Edith finds a copy of a Doyle book mixed in with his medical text books, as he assumes the problem-solving fact monger position quickly. Alan goes into Sherlock Holmes mode immediately after the murder of Mr. Cushing, insisting (unsuccessfully at first) upon examining the body when he suspects foul play. Alan continues to use science and detective work to uncover the truth of the situation, from the cheque issued to the Sharpes to contacting the Cushings’ attorney. While Alan does this out of love for Edith, he is methodical and thorough so that his case won’t be rejected by the love-struck Edith. He is method and science to the core, and as such, we get to follow his story as a murder mystery which stars him as the lead detective. He even gets a big reveal moment when he explains Edith’s poisoning and her father’s murder to her. As such, Alan comes to represent the rising popularity of not only the mystery novel, but the rise of scientific evidence being used to debunk the cover-up of criminal activity as well as the myths and superstitions left by ghost stories and folklore. He is the transition away from blind plot convention toward an explained, measurable story. Where this leaves us is an interesting marriage between the genres of autobiography, the supernatural and science, which forges a new type of literature. Early in the film, Alan attempts to appeal to Edith’s sense of the supernatural by examining photographs demonstrating life after death. This action works to validate her life’s work of writing horror, as well as to embrace her insistence that the supernatural is, indeed, real. This marks the shift in perception of women’s social expectations, as well acknowledgment of her history and beliefs. Alan also uses science and detection to save Edith’s life; later, Edith uses the ghost of Thomas to distract Lucille during their final battle, an act which ultimately saves Alan’s life as well as her own. By combining both scientific fact and the confrontation of the autobiographical via the supernatural, they are able to survive. They quite literally have to contend with the mad woman in the attic in order to come out on the other side, a mad woman that has caused death so traumatic that it leaves a psychic imprint on the physical world. This combination gives us something new: the notion of life after death as a fact, something tangible and narrative. The beginnings of a perfect marriage. 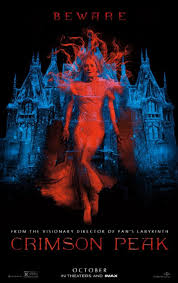 The result is that Crimson Peak‘s lead characters represent a cross-genre pollination that broadens perspective. Edith and Alan are not siloed; rather, they combine to form something different, a new novel that draws multiple aspects in a time where it was expected to remain within your station. The lesson we take from Crimson Peak is that we should not dismiss the possibilities of multiple genres occurring at once. It can be a love story; it can be a ghost story; it can be a tale of redemption as well as criminal activity. It can be just as real as it is fantasical, which, really, is the hallmark of a story well-told.